If you're also wishing for some things from J. Crew, I have the perfect J. 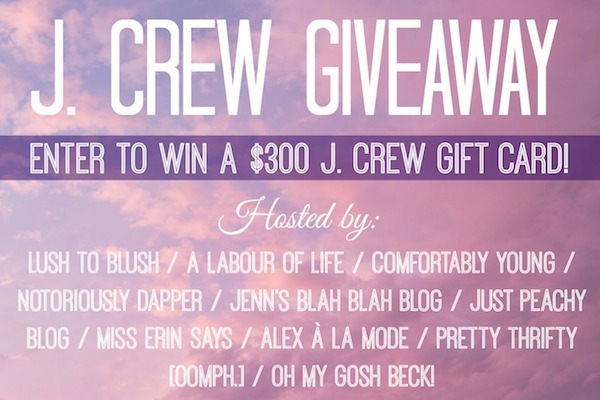 Crew giveaway for you today. One lucky reader will have the chance to shop to their heart's content with a $300 J. Crew gift card... and it just might be you. You can enter daily over the next two weeks and earn bonus entries by sharing the giveaway with your friends on social media. This is an international giveaway that ends on 7/23/14. Enter via Rafflecopter below. Good luck! Love the outfit doll the contest had not started yet nice giveaway. Great giveaway, good luck to everyone!! I need those RayBans. Asap. I love this brand and this is a fantastic Giveaway! I love my new Fendi bag! Oh, wonderful. My sister loves J.crew. I would probably give this to her if I won. I love the outfit. I like the turquoise color of my shirt. I love how comfortable my outfit is today! I love my old school Le Tigre Polo. I'm wearing a neon pink tshirt and I just seem to love this color with anything else in my closet! I like that my outfit is comfortable. Nice giveaway! I am participate :) Like the sunnies, bag, hat and sneakers. It was comfortable and let me chase my kids! I'm in "house clothes" today, but loved my lace belt yesterday! I like the shoes I wore today. I wore a dress and it was super comfy and cool in this heat! I love the pop of hot pink with my black maxi dress!! I love how comfortable I am. I like to be dressed cute but comfy! That it is fitting loosely because I've been losing weight. Oh my goodness! What an exciting giveaway! I love the pieces you chose, especially the glasses. I love my ivory dress! Thanks for this giveaway! love how comfortable I am. I like to be dressed cute but comfy! I like the white tank I'm wearing, it shows off my tan. I love this sporty set you put together Rowena! Thank you for the amazing giveaway! I can't see the rafflecopter widget but maybe because I'm reading from my cell phone! I love this brand... great set Rowena!!! Oh wow, his is such an amazing giveaway Rowena! I love J.Crew! Who doesn't love J. Crew?! This giveaway is amazing. It is comfortable and keeping me cool while cleaning. I love the pastel, floral pattern on my skirt. I like my hat today. I love how my outfit makes me look tanner than I am! What a generous give away! Hope I win! 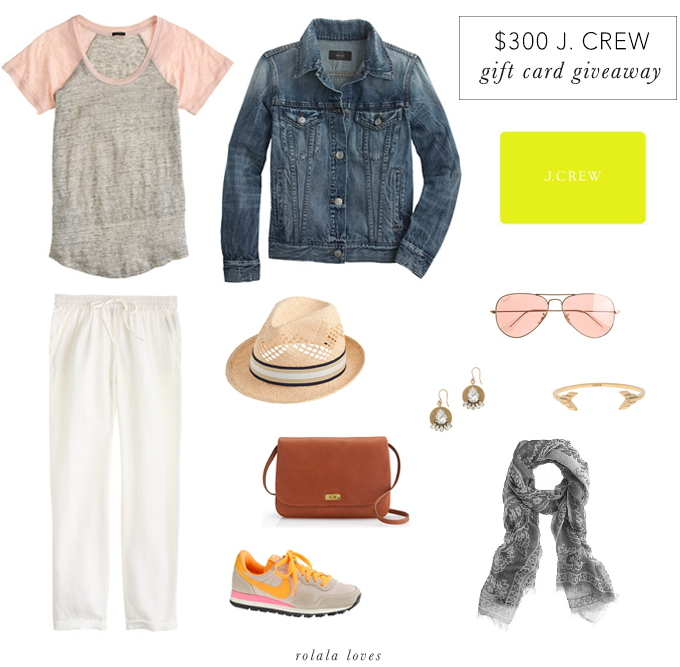 JCrew always has such great clothes and the best accessories! I love JCrew! Such great pieces to add to any wardrobe! It is cute, but still mom appropriate! I love the chunky beaded necklace that I wore today! I love J. Crew! My favorite thing about my outfit today is my comfy pair of leopard print sneakers from H&M. Such an awesome giveaway- thank you! I love the tank top I have on, it's very pretty! I'm currently wearing shorts and a tee for housework...it's comfy and can get dirty which is good. Just a t-shirt and shorts. I love my new Fendi sunglasses! I love my shorts, they are comfy! My favorite thing about the outfit today is the Linen Drapey Drawstring Pants in white. My destroyed denim from Aero. I like how comfortable my outfit is. I am wearing yoga pants and a loose fitting tank. My favorite thing about the outfit today is my clutch! i like the bag most! My favorite thing about the outfit today is my belt. What I like most is the comfort. I loved the hematite necklace I wore today! I liked my outfit today because it was a maxi dress and it helped to keep me quite cool in this heat! I love the comfort and colors of it. I love everything , all the items are so lovely and specially the hat! my dress with flower print! I love my new orange bikini! My banana republic dress pants. My tee-shirt is authentic vintage. My outfit right now is t shirt with a snake design logo, puma jogging pants and sandals. I like the T shirt because it's a batch t shirt, so every time i go out of town wearing this shirt, it gives prestige to me because I came from that exclusive school. I love my denim jacket.